I have always been fascinated that there are only seven story plots for movies, fiction, TV and all. Sometimes when I’m watching a movie, I have this deja vu feeling all over again and that’s probably why. Here are the seven plots taken from a book by Christopher Booker. But wait, this is a woodworking blog, so how does this relate to woodworking? It does, and here’s how. Megan Fitzpatrick was recently named Editor of Popular Woodworking Magazine and is taking some grief from her buddy Chris Schwarz about it. Go read his blog interview with Megan and see what kind of grief (“So one of my favorite internet comments about your promotion was this: “Great, now it can be a mediocre magazine with a feminine touch.” How does that make you feel?”). After a great discussion about garden gnomes and heart shaped cutouts, Megan goes off to be the Editor and I alone am left to tell the tale. 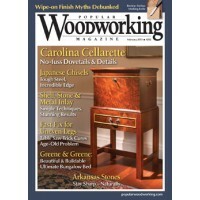 I usually read two woodworking magazines — Fine Woodworking and Popular Woodworking Magazine. I feel for Megan because I think there are a limited number of topics in woodworking magazines — in fact, seven may do it. Think about it, you see articles on jigs, furniture, sharpening, drawing, tools, joints and wood. Every article you see may fit into one of these categories (except, “I just nailed the top of a baby food jar to the bottom of a shelf and I can put screws in the jar and still see them). In fact, Fine Woodworking for December is sitting here on my desk and the cover lists lumber, built-in, jig, tool test, Shaker style, tabletop. I think it has all been done before. If I were going to try to write an article for Megan to publish, would simply go back say 20 issues, pick a topic, take some new pictures and do it all over again. Some would want to call that plagiarism — I could argue history. But unless someone does it, there is no magazine. Seven topics. Is there nothing new under the sun? Course in music there is only ABCDEFG — right Mozart? Just think of artists pallets. They don’t have 16 million different colors to start with. They have a selection of basic favorites and from there go on to blend them to achieve whatever colors are needed. In woodworking it may seem there is a limited set of subject matter, but the variations in design, materials, and technique are almost limitless. It’s the subtleties that keep the material presented in the mags interesting and worth hearing about. There is no “end of story” to how something or other might be done. I know this is true. I save all my magazines and store them in a filing cabinet. But before I do this I enter all the projects and tops into an ACCESS database so that I have quick access to ideas. I frequently have duplicates, EXACT duplicates of projects from different magazines. I even had one that duplicated it’s own magazine in it’s entirety. They had a different cover and when I purchased it the second time. It wasn’t until I looked in my database that I realized their error, or deception. There is an element of truth here, but it’s not as simple as that either. “projects” as a category is pretty broad, and just because there are two project articles doesn’t mean that there is any relation between them – much less repetition. Magazines are an interesting situation, as they have a limited shelf-life. For folks that subscribe, having the exact same topic or tech tip repeated over and over is a problem, so it’s important to keep it fresh. At the same time, new folks pick up magazines at the store so it’s appropriate to repeat some things. It sounds like a really tough job to me, because there is a limited (albeit large) scope of what then can cover. 7, 8 or even 10 plots — No different than the rest of the world. Everything in the world is made up of a fixed base something / some things. The only difference is how we combine the basics into a million various combinations. My G G G G G Grandfather may have build something that I replicate. But, I don’t get the enjoyment of doing it until I do it myself. I may appreciate his, but he did it, not me. When we were first learning, everything was new. Now it may be old hat. But that doesn’t mean it is wrong to do the umpteenth article on sharpening. The article is new to somebody. Actually, maybe it is time for many of us to transition from student to teacher and teach the next group of new students/learners. 3rd thought. Not uncommon for the new student to want shiney new tools, until they learn the value of old tools. Every generatiion has to discover the world for themselves. Seems like someone said a loooonnnggg time ago that there is nothing new under the sun.